​Mech-Chem offers engineering, design, fabrication, and installation services for all air quality handling equipment & systems. Our range of services are designed to minimize a variety of airborne pollutants and regulated emissions such as acid gases, fumes, corrosive or hazardous streams, air particulates and other organic odors. 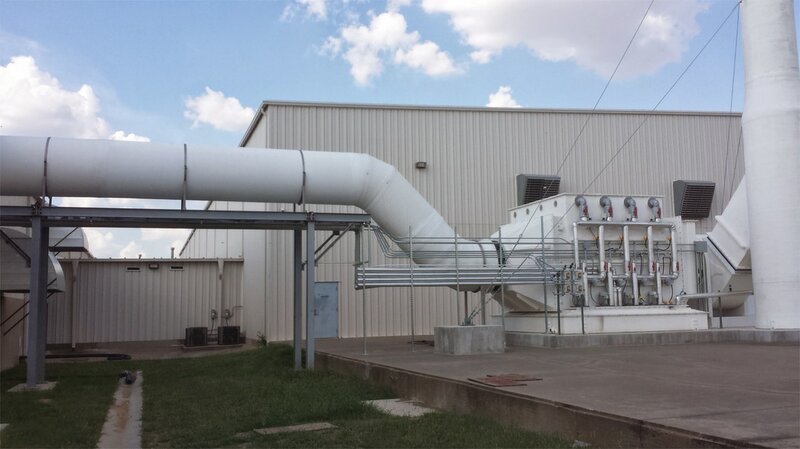 ​All of our scrubber & ventilation air handling systems can be custom designed to fully integrate into your current facility and operating needs. 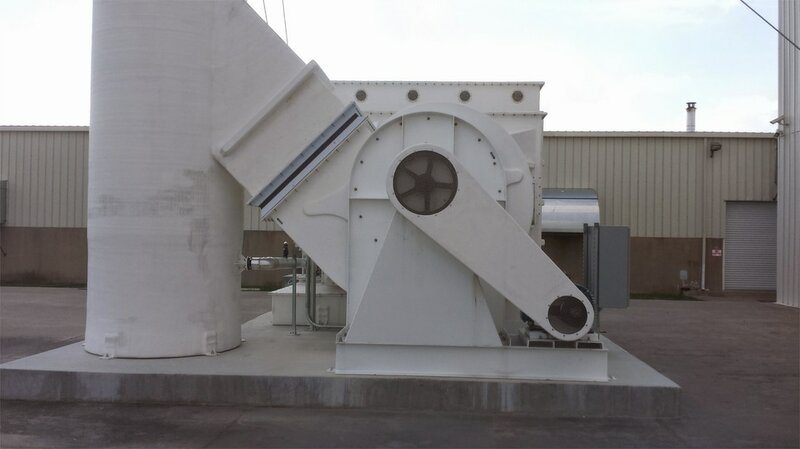 A scrubber is used to "scrub" exhaust streams of unwanted solids, liquids, or gas particles before they are released into the atmosphere. Scrubbers help to control all forms of vapor/gaseous air pollution emissions which are hazardous to the environment. 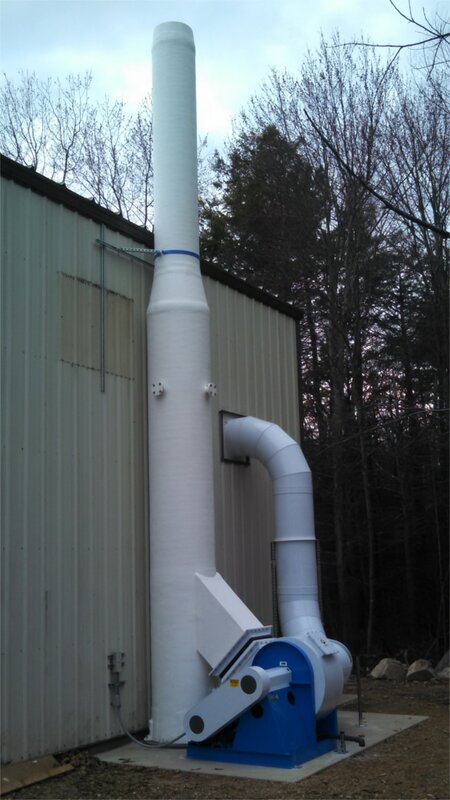 Scrubbers can be designed in many different sizes, styles, and materials of construction based on your facility's chemical emissions. The most common type of scrubber is a wet scrubber. 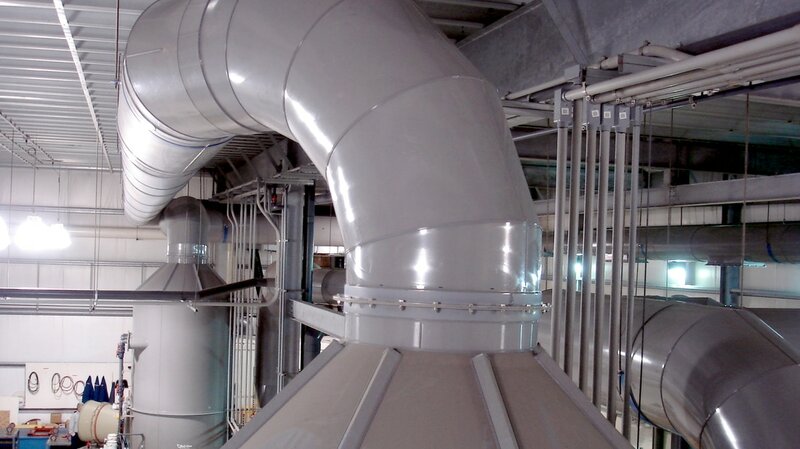 In a wet scrubber a fan or blower system is used to draw chemical vapors through ductwork and into the scrubber tower. The chemical vapors are drawn into the bottom of the tower and pass up through a packed bed chamber. This packed bed chamber is wetted with a chemical reagent (or water) via spray nozzles inside the tower. This reagent is used to neutralize any hazardous fumes or any unwanted particles from the chemical vapor stream. The chemical vapors then travel up through a mist eliminator to remove additional particulates and water droplets. The now scrubbed vapors are blown into a stack and dispersed to the atmosphere. A wet scrubber is just one example of the many types of air pollution control technologies available. All scrubbers can be designed vertically or horizontally to accommodate facility floor space or height requirements. Vertical packed towers are designed with a counter current flow while the contamintated air stream flows upwards and recirculating liquid sprays downward through into the packing media. The gas contaminants are adsorbed into the liquid. Vertical Scrubbers tend to have a higher effeciency rating than those of horizontal scrubbers while taking up a smaller footprint. Horizontal packed bed scrubbers are often utilized when clients have a limitation on headroom or a low-profile design is needed. Horizontal Scrubbers are designed so that the gas stream passes horizontally through a section of packed media, while liquid scrubbing solutions still passes down vertically. 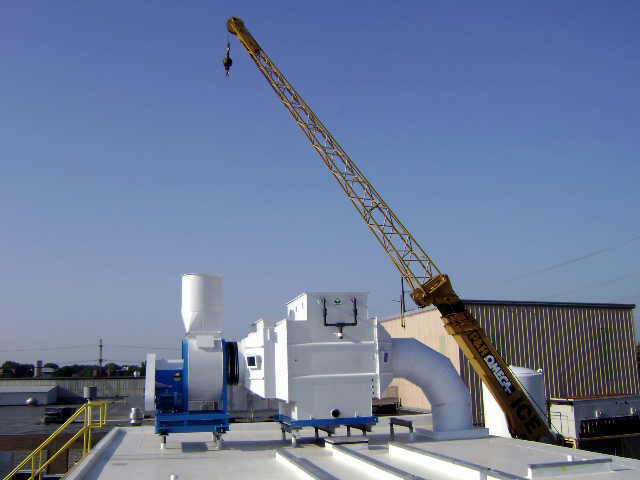 Mech-Chem offers a complete scope of fume scrubber & ventilation services from simple hood design all the way to full scale turnkey operations. We specialize in handling all types of acid fumes and hazardous/corrosive streams, to ensure our clients have a neutralized & contaminant free air stream during emission. 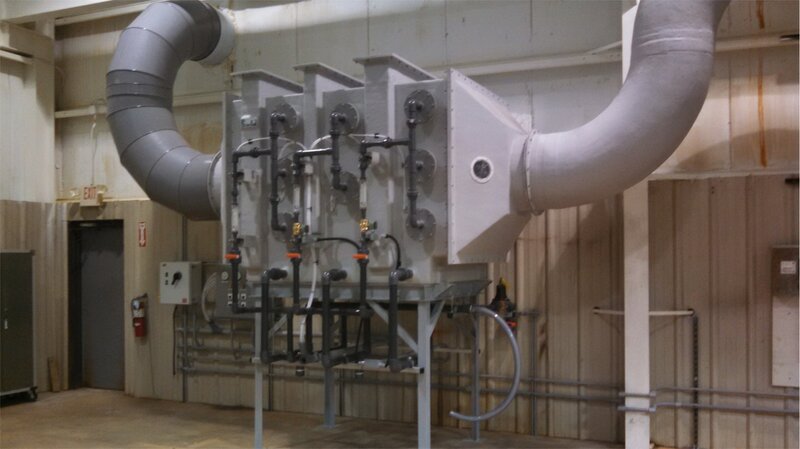 Mech-Chem designs, fabricates, and installs all types of fume scrubbers to be fully integrated into our client's production need. Each concept design is carefully made to meet the specified space & safety requirements. 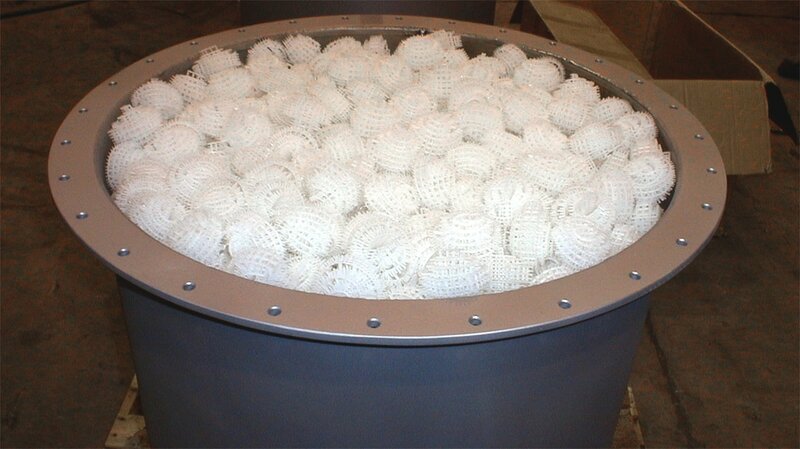 Scrubbers are designed to be complete ready for installation during delivery. 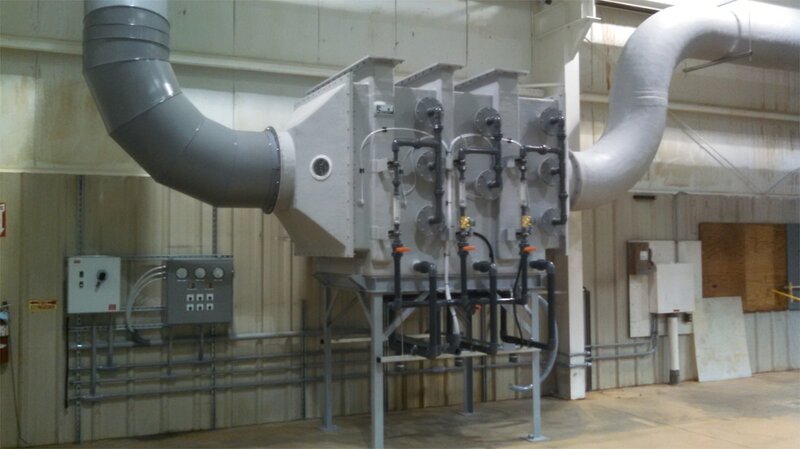 ​Mech-Chem designs builds and installs Scrubbers to handle all types of chemical fumes. 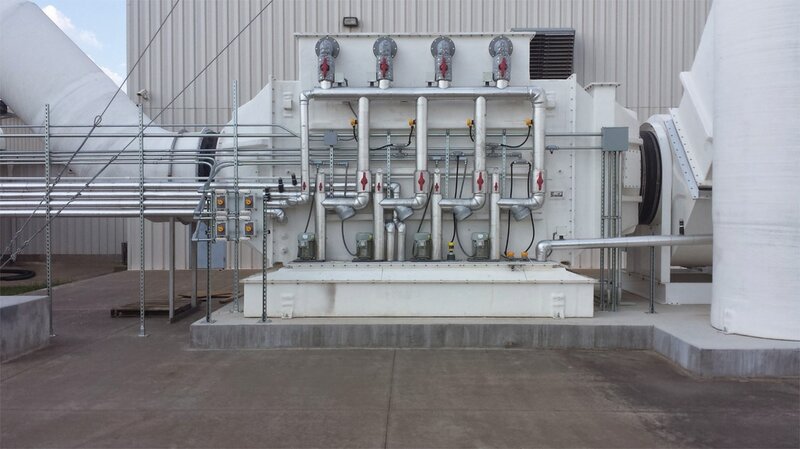 Acid processing industries often generate fumes that need to be neutralized and reduced to a harmless vapor before discharge to the atmosphere. One of the most efficient, economical and low maintenance ways to scrub acid fumes is with a Wet “Packed Bed” Scrubber. These scrubbers can be Vertical or Horizontal in orientation all depending on the facility’s needs and location of the unit. The amount of packing, size / diameter of tower, water circulation rate, blowdown and static pressure are all calculated based on the facility’s ventilation requirements. A Wet Packed Bed Scrubber utilizes a tower, which contains the packing, and a reservoir located at its base. The reservoir is filled with solution which is drawn out by a circulation pump and dispersed above the packing by an array of spray nozzles. 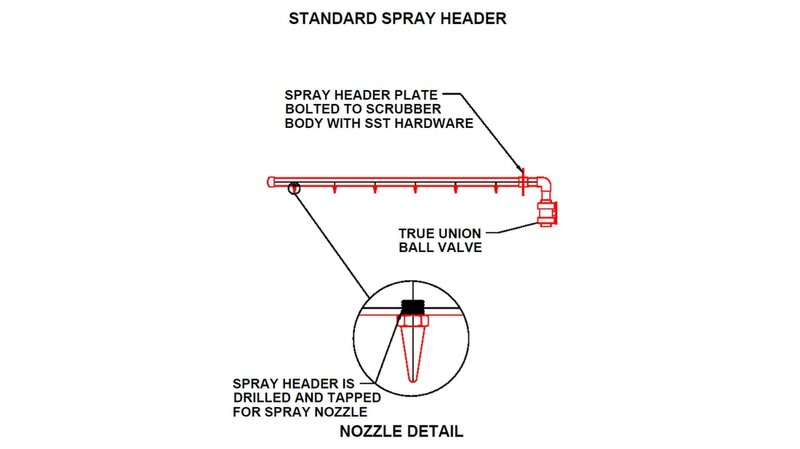 This solution is used to remove the acid from the vapor stream and the spray nozzles ensure full coverage of the vapor stream to prevent channeling or allowing untreated air to pass through the scrubber. This solution streams down soaking the packing and allowing the vapor stream, which is flowing upwards (countercurrent to the stream of liquid), to contact the moisture on the packing. 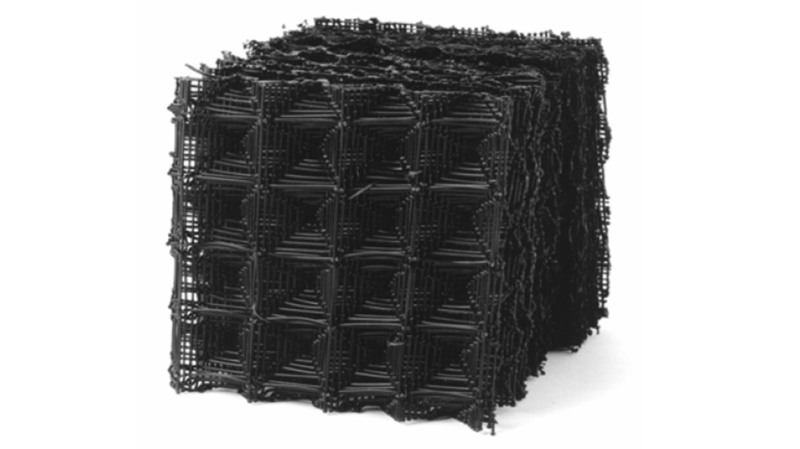 The geometric design of the packing, combined with the depth of packing in the tower, greatly increase the surface area on which the solution and the acid fumes come in contact with each other. This increased contact time is critical to ensure the vapor stream is sufficiently treated and cleaned. 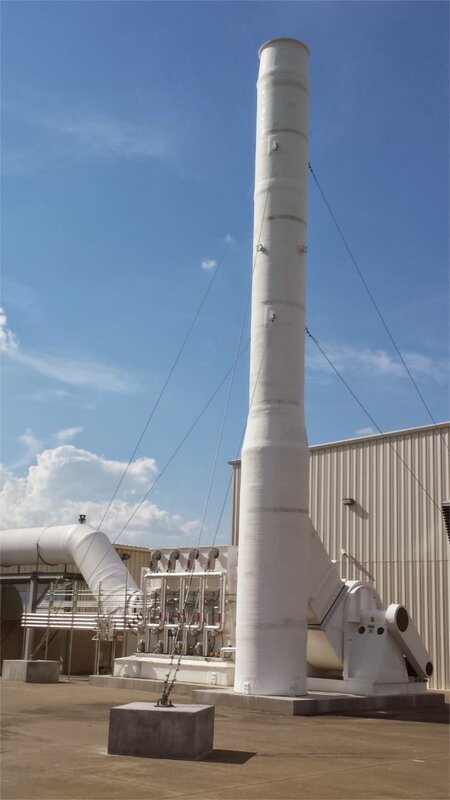 Any water droplets left in the clean air stream after it has passed through the packing will be removed by a mist eliminator located at the top of the scrubber tower. Once the vapor passes through the mist eliminator it travels through the blower and out the stack into the atmosphere. This covers the basic flow of an Acid Scrubber, the following discusses the treatment process in more depth. In order to efficiently metalize the acid in the air stream a base solution is injected by a metering pump into the reservoir. This base chemistry is mixed as the circulation pump draws it up and into the spray headers and it sprays back down into the reservoir over the packing. The amount of base chemistry required is monitored by a pH probe located in the reservoir. 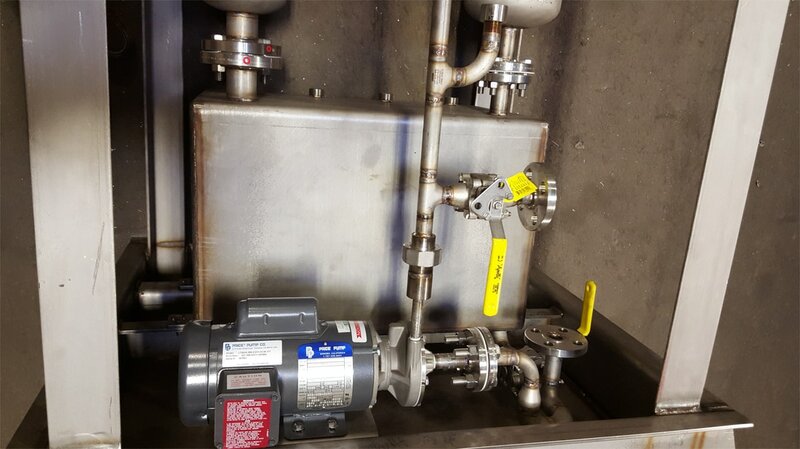 When the pH drops below the pH set-point necessary to sufficiently treat the acid vapors the metering pump will activate adding additional base chemistry into the scrubber reservoir. The most common base solution used in Acid Scrubbers is Sodium Hydroxide (NaOH). NaOH reacts with most acids to reduce them to a benign salt solution and water. 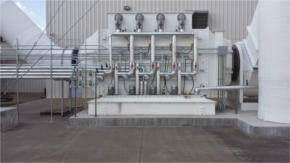 In order to keep the reservoir solution from building up with these salts a small waste stream, called the blowdown, is removed from the scrubber in order to add fresh water and keep the specific gravity of the liquid in the reservoir low enough so the salts will not precipitate out of the solution. If the reservoir is allowed to become too concentrated a coating will begin to build up on the packing. Overtime the efficiency, air flow and static pressure in the scrubber will be impacted to the point where the scrubber will no longer remove and treat acid fumes properly. The salt, NaCl, is removed by the blowdown process prior to it precipitating and plugging the packing. With the correct amount of packing a 99.9% efficiency can be achieved. HCl is very soluble in water thus in some applications water alone may be sufficient enough to scrub the HCl gas. In order to break down this HCN both Sodium Hydroxide (NaOH) and Sodium Hypochlorite (NaOCl) need to be used. 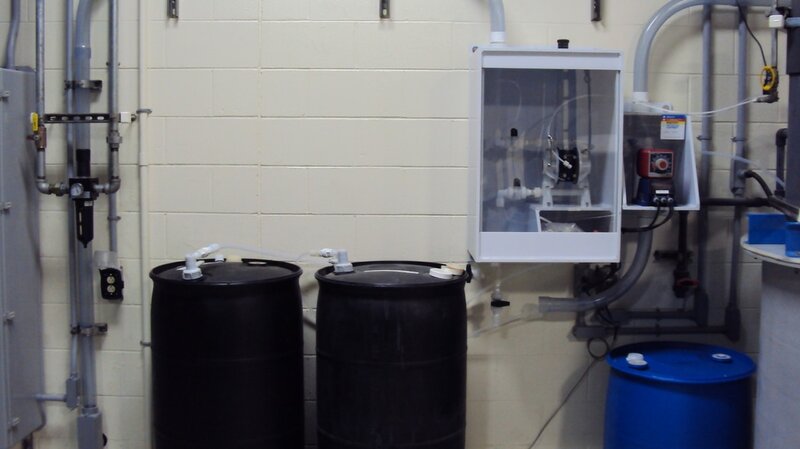 This treatment method requires instrumentation to monitor both pH and ORP. The pH must be kept above 9 so deadly gases [Cyanogen Chloride (CNCL) and/or Nitrogen Trichloride (NCl3)] do not form. The salt byproduct of Sodium Cyanate (NaCNO) is not as toxic and is flushed out in the blowdown process. Hydrogen Sulfide is a common air pollutant, typically found in landfills, known for its foul smell and highly corrosive nature. Mech-Chem has a lot of experience designing, fabricating and installing Scrubbing Systems that removes H2S from Methane (CH4) so the biogas is pure enough to use as a fuel source. NOx is a class of pollutants that is a binary compound of nitrogen and oxygen often generated from non combustion processes like metal refining, pickling or plating baths, and nitric acid operation processes. Most common forms of industrial hazardous NOx fumes needing to be scrubbed are Nitrogen Oxide (N2O), Nitrogen Dioxide (NO2), Nitrous Oxide (NO). 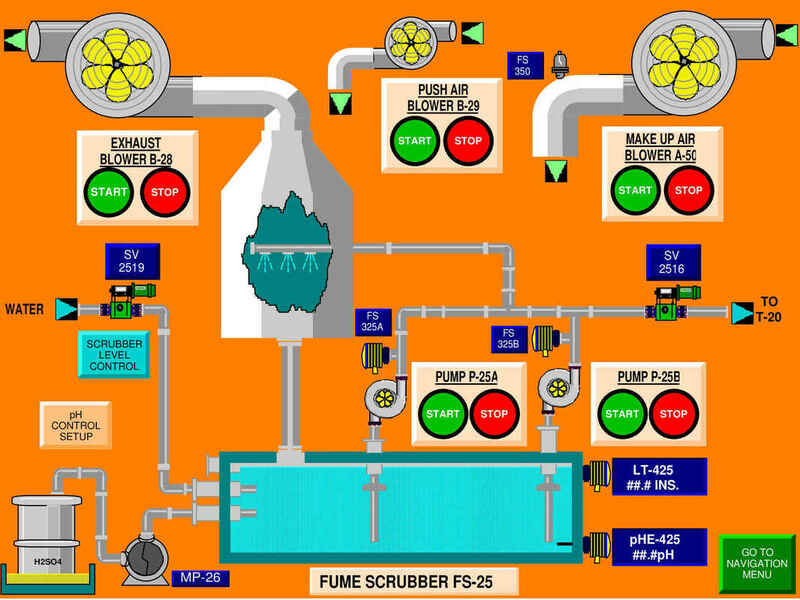 NOx scrubbers systems are designed to scrub any NOx fumes, colorless & colorized (brown/orange) plumb, and eliminate any Hydrogen Sulfide (H2S) odors. 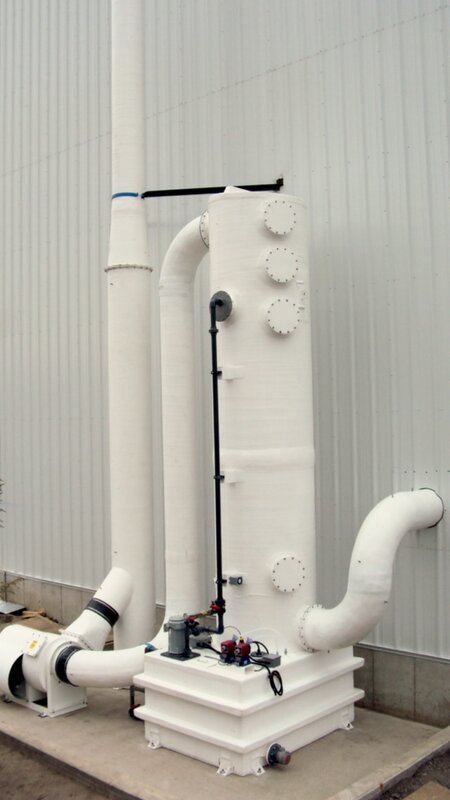 ​​​A high efficiency wet scrubber is required to prepare NOx fumes for emission to the atmosphere. 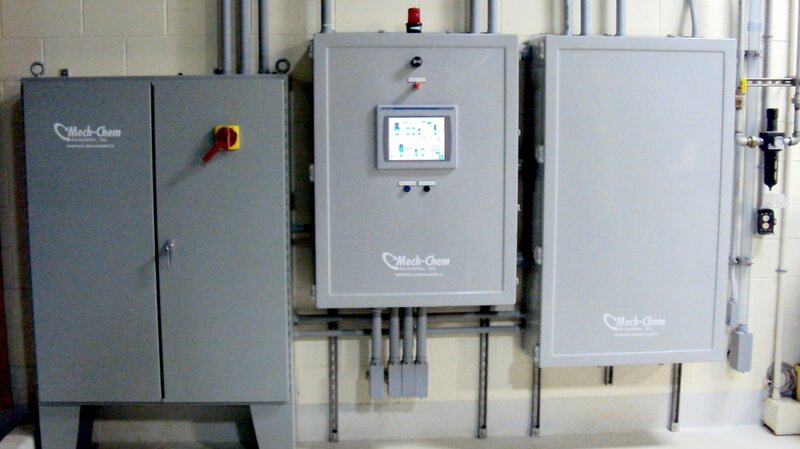 Mech-Chem has designed and installed many wet scrubbers for customers in a variety of industries. These scrubbers are economical, reliable, and require very little maintenance. This type of wet scrubber, or NOx scrubber, uses a single reservoir with a packed bed. Caustic, along with a strong reducing agent, is sprayed into the NOx fume stream. This process breaks down the NOx gases and allows a treated and odorless vapor to be emitted into the atmosphere. 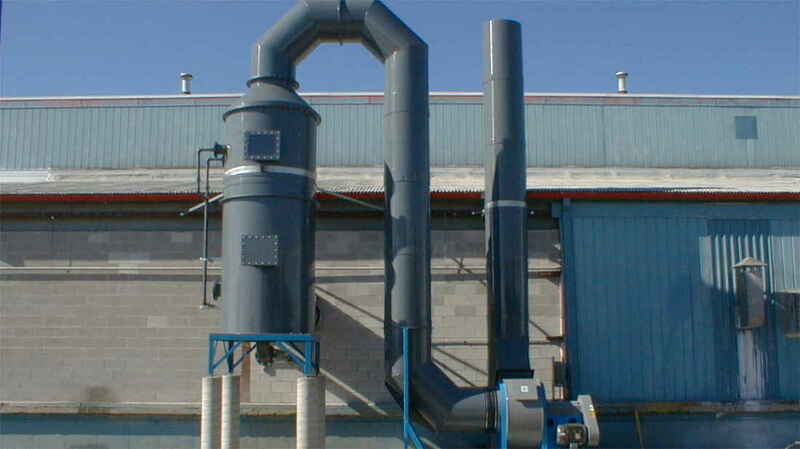 ​​A high efficiency wet scrubber is required to prepare NOx fumes for emission to the atmosphere. Mech-Chem has designed and installed many wet scrubbers for customers in a variety of industries. These scrubbers are economical, reliable, and require very little maintenance. This type of wet scrubber, or NOx scrubber, uses a single reservoir with a packed bed. Caustic, along with a strong reducing agent, is sprayed into the NOx fume stream. This process breaks down the NOx gases and allows a treated and odorless vapor to be emitted into the atmosphere. 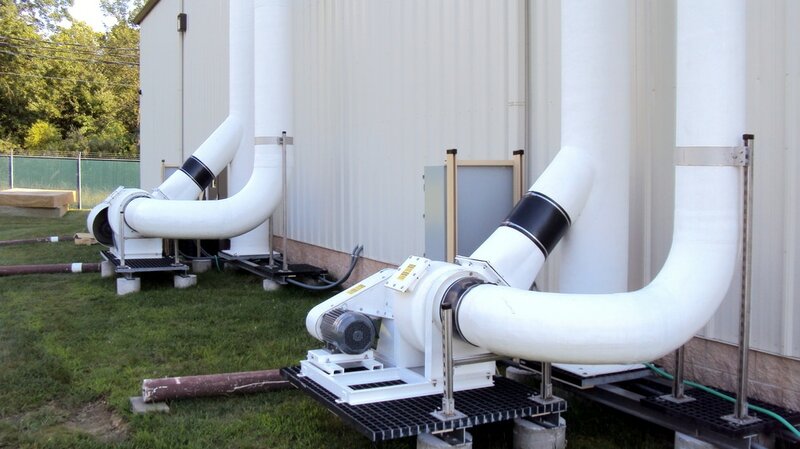 ​​The proper treatment of NOx fumes relies on two major factors. First, it is imperative to have the appropriate level of chemistry in the reservoir and allow the chemistry to circulate through the scrubber at the proper rate. Second, the correct surface area of packing must be calculated and installed to make sure the fumes and circulating solution have the proper contact time. The flow rate of the air stream, the ratio of NO/NO2 and the outlet NO limit required are what determine the depth of the packing. 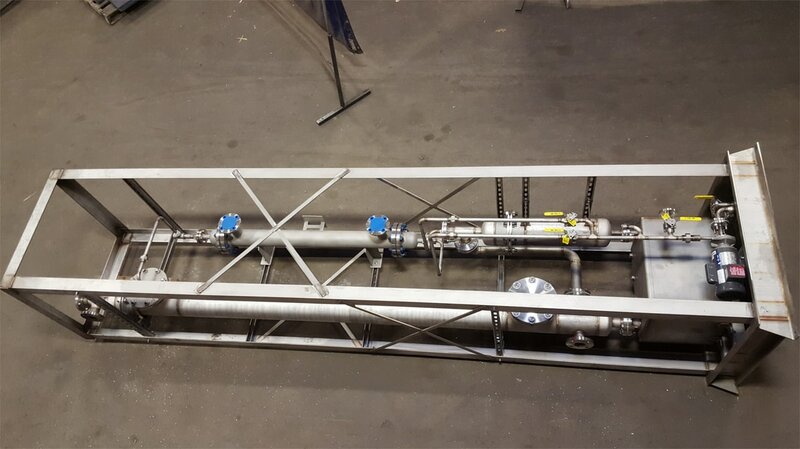 A greater depth of packing, and thus a greater surface area, results in extended contact time between the NOx gas stream and the scrubbing solution resulting in a more efficient scrubber. Using an integrated reservoir the scrubber can be designed in many different configurations. 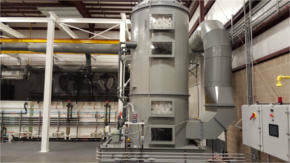 Typically a NOx scrubber incorporates two or more vertical towers. The dual towers allow for a greater depth of the packed bed without having a single, extremely tall, tower. This two tower design has the air flowing up through one tower and then being directed from the top of that tower to the bottom of a second tower where the air again is drawn upward through the packing. Although the vertical tower style is the most common NOx scrubber the scrubber can also be designed to be horizontal. Regardless of the number of towers or orientation of the scrubber all of the packing is wetted with a scrubbing solution from a common reservoir. 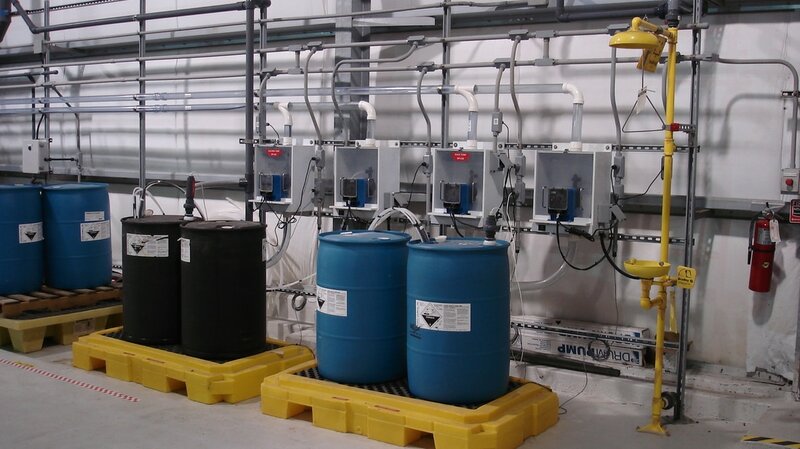 The reservoir consists of a level controller to monitor the water make-up, a pH monitor which controls the injection of Sodium Hydroxide (NaOH), and an ORP monitor used to control the injection of a strong reducing agent such as Sodium Hydrosulfide (NaHS) or Sodium Sulfite (Na2SO3). A strong reducing agent, as mentioned above, is often used because scrubbing NO2 with only Sodium Hydroxide is very inefficient. The ORP controller controls the amount of Sodium Hydrosulfide (NaHS) or Sodium Sulfite (Na2SO3) to a millivolt reading of about -400mv. The pH controller adds Sodium Hydroxide (NaOH) to maintain a pH of 12.5 or higher to minimize Hydrogen Sulfide (H2S) emissions. It is important to maintain the cleanliness and calibration of all the instruments because the pH and ORP are inversely proportional, as the pH drops the ORP will rise and vice versa. It is essential to hold the pH set point to ensure proper chemical addition and operation. If other factors beyond the treatment of NOx and the level of NO emissions exist, such as inlet temperatures, pH of the exhaust gas or odors in the exhaust, additional steps can be incorporated to address these issues. ​Mech-Chem designs, fabricates and installs Chrome Scrubbers for all types of Chrome applications including Anodizing Chrome, Chrome Etching, Chrome Manufacturing, Chrome Plating, Chrome Stripping, Decorative Chrome Plating and Hard Chrome Plating. ​Chromium manufacturing and plating processes, which include the use of Chromic Acid, Trivalent Chrome and Hexavalent Chrome, have much more stringent air emission control and monitoring requirements than other types of acid processes. A packed bed scrubber with a Chevron mist eliminator will have a moderate Chrome removal rate. Using a mesh pad instead of a mist eliminator will increase the amount of chemical laden droplets kept from exiting the scrubber, yet neither of these designs offer the high efficiency removal rate required by today’s air emission standards. The majority of scrubbers function using adsorption, which involves the contact of a gas stream with an aqueous solution, due to the fact that the Chrome exists in the mist droplets, and not as a gas, the adsorption method is not effective. To properly scrub Chrome, mesh pads are used to create separation of the Chrome laden vapor from the air stream on contact. By using these mesh pads in a multi staged set-up, within a Horizontal Scrubber, Chrome scrubbing efficiency greater than ​99% can be achieved. The mesh pads are key in Chrome Scrubbing due to their high removal rates of Chrome, ability to handle moisture build up, resistance to being plugged, reduction of pressure drop through the scrubber and their ability to handle larger volumes of air laden with Chrome contaminated liquid. These factors reduce both operating cost and overall maintenance of the system. A high efficiency Chrome Scrubber tends to have three internal stages separated by media. The viscous acidic Chrome droplets tend to cling to the mesh pad in the first stage. As the air passing through the scrubber continues to bring in water droplets laden with Chrome, the Chrome on the first stage mesh pad becomes more concentrated and viscous. Any Chrome breakthrough will be trapped on the mesh pad in the second stage. The third stage is used as a factor of safety to verify water droplets or airborne Chrome does not exit the scrubber to the atmosphere. Cleaning the mesh pads simply requires an internal spray header, located behind the pad, to mist water onto the back of the pad. This wash down process is set up for each pad. The frequency of wash down is predicated on production, as the less airborne Chrome present the less frequent the mesh needs to be flushed. In order to monitor and verify efficiency of the scrubber meters reading pressure differential should be placed in each stage of the scrubber. A Chrome Scrubber is also fabricated so each of the three mesh pad stages drains into its own reservoir. The first stage is typically designed to be flushed, with fresh water, every hour. The second stage is typically washed down every 24 hours. The third stage only requires irrigation on an as need basis, usually every few weeks or based on its build up or back pressure as indicated by the pressure differential. The blow down times for the different stages can be changed depending on the amount of production and flow rate through the scrubber. The length of time for the blown down and flow rate in the first stage is recommended to be 1 minute at 0.5 to 1.0 gallon per minute per square foot of open area. Stage two is 1 minute at 0.25 to 0.50 gallons per minute per square foot of open area and the third stage blow down time is dependent on flushing it to the point that the pressure drop reduces, indicating the majority of debris has been removed from the mesh pad. The third stage commonly has a flow rate of 0.25 to 0.50 gallons per minute per square foot of open area. Again, frequency and flow rate of each stage can be adjusted to keep the pads clean. The benefit of these long intervals and low flow rate wash downs is that the Chrome Scrubber does not produce large volumes of water. 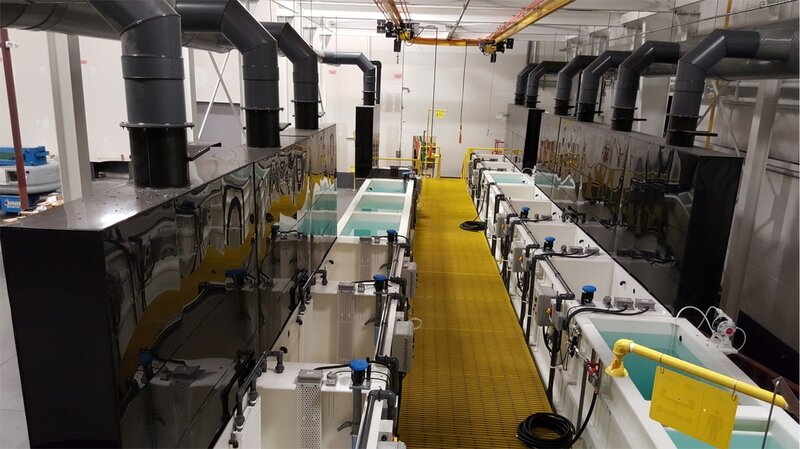 In addition to the sectioned areas in the scrubber, the wash down water in stages one and two may have a Chrome concentration high enough to return to the process tank and not have to deal with the treatment and disposal of Chrome. As explained in this brief write up Chrome Scrubbers are unique in their dry operation design. The use of mesh pads is far more efficient than the standard packed bed wet fume scrubber typically used on other acid fumes. 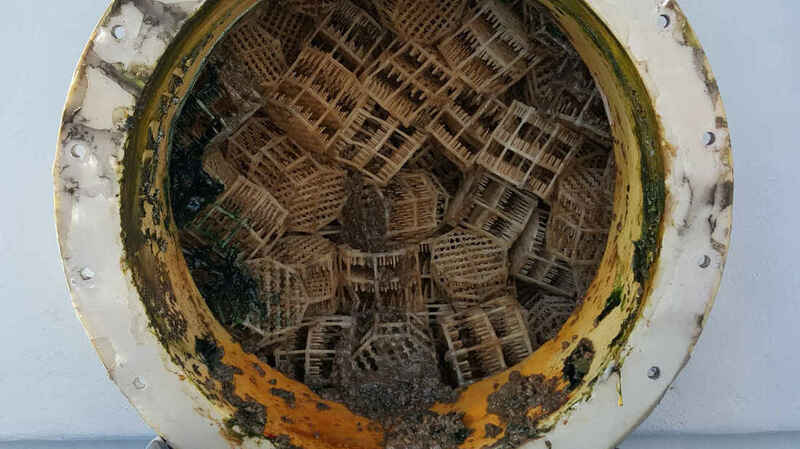 The use of mesh pads in the Chrome Scrubber generates less waste water and the solution generated from the wash down of the pads has high Chrome content that is usable in production. Please feel free to contact Mech-Chem to find out more about Chrome Scrubbers and the different design and equipment options that will help meet your Facility’s needs. Ammonia (NH3) is a colorless gas with a pungent odor at concentrations above 50 ppm. Ammonia is an irritant to eyes, nose and throat and even poisonous at higher levels. Additionally, when mixed with air at certain concentrations, Ammonia will become explosive. Due to these unique characteristics of Ammonia, the treatment of Ammonia gas is handled differently than other vapors typically found in industry. Ammonia Scrubbers are Chemical Scrubbers and as such they function like a wet scrubber, where water is sprayed over a packed bed of media countercurrent to the flow of air. Due to the high vapor pressure of Ammonia, the use of water alone will not work because the recycled water will become a solution of dilute ammonium hydroxide (aqua-ammonia). Sulfuric acid must be used in combination with water. The sulfuric acid creates a chemical reaction with the alkaline Ammonia which neutralizes the Ammonia and effectively scrubs the air stream. When the Ammonia is neutralized in this fashion a salt by product (ammonium sulfate) is produced. Like other scrubbers, a blow down rate to a waste water source is required to prevent the salts from concentrating inside the scrubber. ​Due to the toxicity of Ammonia, and its strict discharge limits, Ammonia needs to be treated reliably and efficiently to make sure the emissions are at or below the required levels. For Ammonia Scrubbers to meet these standards, a number of variables need to be reviewed including, but not limited to, concentration of the gas stream, other chemicals in the air stream, particulates, temperature and flow rate. 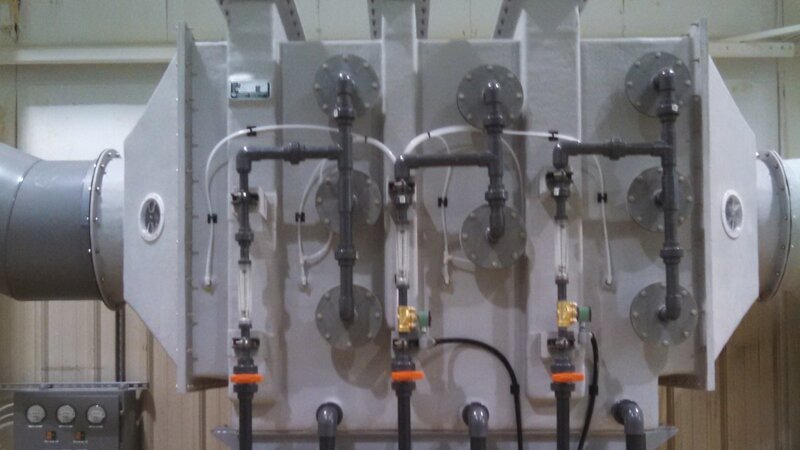 ​Mech-Chem is capable of dealing with all of your Ammonia Scrubber needs. Mech-Chem engineers, designs and manufactures high quality Ammonia Scrubbers that operate at or above the required removal efficiency. We specify materials of construction, design parameters (such as explosion proof), as well as equipment size for the entire chemical process. These scrubbers can be custom designed to meet your facilities specific needs and are designed for long operating life, energy efficiency and minimal maintenance requirements. Additionally, we offer complete installations, start up and training at your facility. Mech-Chem will also layout and develop any documentation, from calculations to efficiency rates, needed to assist in the Permitting procedure. Please feel free to contact Mech-Chem to find out more about Ammonia Scrubbers and the different options that will help customize the design and equipment to meet your Facility’s needs. Carbon adsorbers are designed for high efficiency removal of oil vapors, H2S and other odors, VOCs and other gas phase hydrocarbons. Carbon adsorption relies on adhesion of pollutant gas molecules to porous solid surfaces that the contaminated air stream passes through. Physical adsorption relies on inter-molecular forces while chemical adsorption involves the formation of chemical bonds. Airborne dust and particulates are very important to maintain in a working facility. 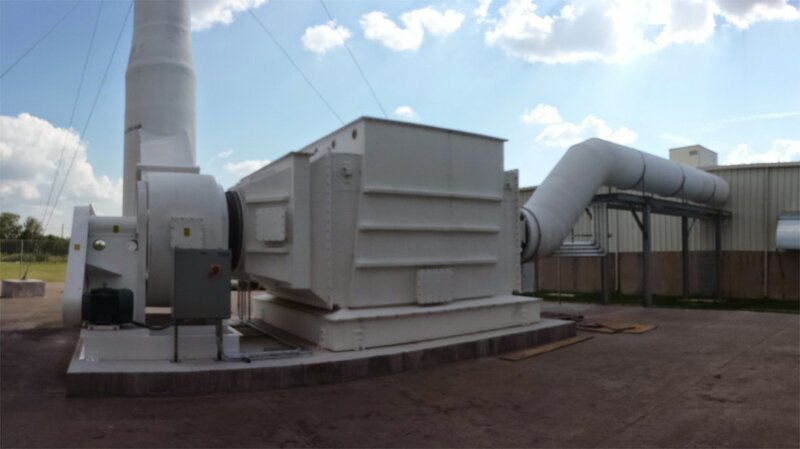 Dust collectors operate at a 99%+ efficiency of being able to remove dust and particulates from continuous facility air streams. Dust collectors are featured with removal filter bag cartridges allowing for continuous operation without the need of operation shutdown. Ozone can help maintain a clean and efficient wet scrubber by ensuring there is oxygen in the waste water stream of the scrubber. The use of Ozone can reduce the consumption of chemicals used during the wet scrubber phase. Ozone is often used in wet scrubbers to reduce odor emissions and can help with any biological/organic growth. Ozone can also help convert Volatile Organic Compounds (VOC's) into CO2. Ozone is created by an on-site ozone generator using compressed air. The Oxygen (O2) is converted through the generator into Ozone (O3) where it is released and dissolved into the water using an Ozone injection system. 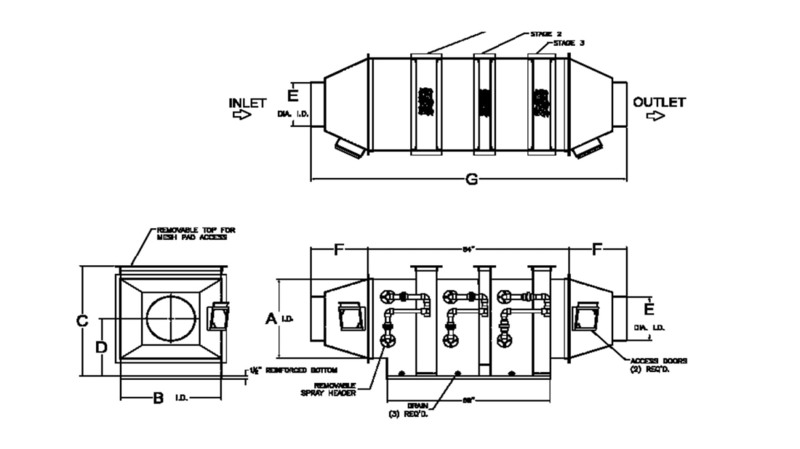 Radioactive Scrubber designs are based upon each individual customer’s needs. Mech-Chem performs a mass balance analysis showing the air flow, temperature, chemistry and radioactive particulates or gas stream as it passes through the required treatment steps. Our engineering firm takes care of all calculations and required equipment sizing based on the type of waste in the air stream. Mech-Chem’s expertise spans a broad range of both materials of construction and operating parameters for radioactive scrubbing. 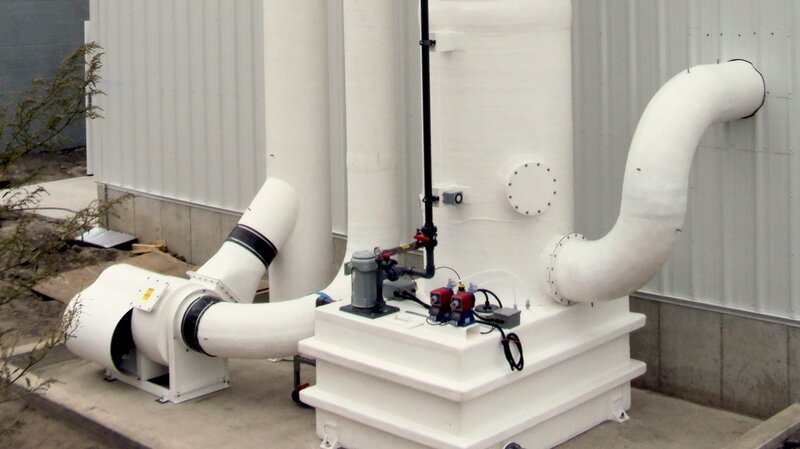 We have installed PVC fume scrubbers using water to adsorb and remove the radioactive materials in the air stream as well as scrubbers made of specialty metals, such as stainless steel or hastelloy, which require heat exchangers to control the temperature of the gas and HEPA Filters to remove fine particulate in order to meet stringent emission requirements. 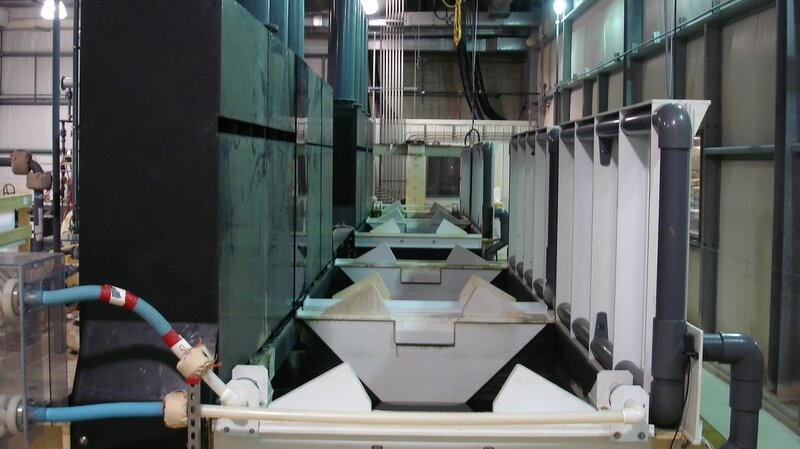 ​​One of the big design challenges of a Radioactive Scrubber is minimizing the amount of solution and materials that will need to be disposed of. This is especially important with regards to the water in the reservoir of the scrubber. The reservoir, especially if it is integrated into the base of the scrubber, will be large in order to support the scrubber and allow the proper depth for the pump suction. Mech-Chem uses several volume displacement techniques in order to keep just enough solution in the reservoir to allow the pump to remain primed and the tower flooded. Mech-Chem also deals with radioactive processes that are mixed with, or produce, corrosive chemical vapors. Some of these corrosive vapors come in mixed form (Example: HCl Acid and Cl- Gas). 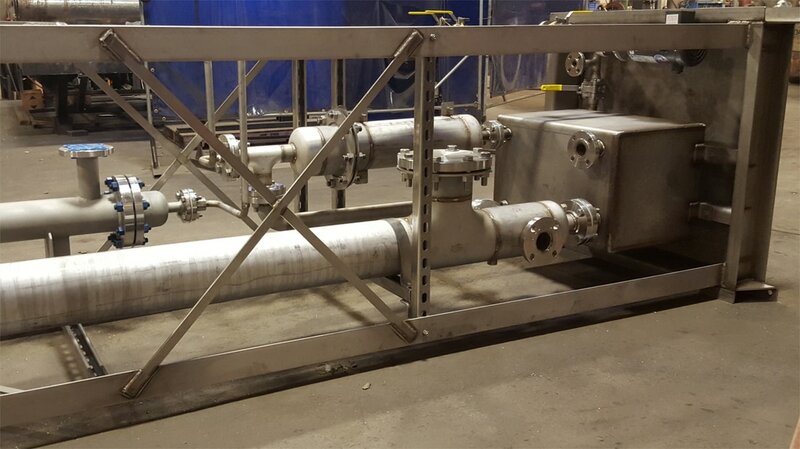 These corrosive vapor scrubbers deal with dual train treatment of the gas stream and give the customer the option to reclaim or neutralize the chemistry of their choice. 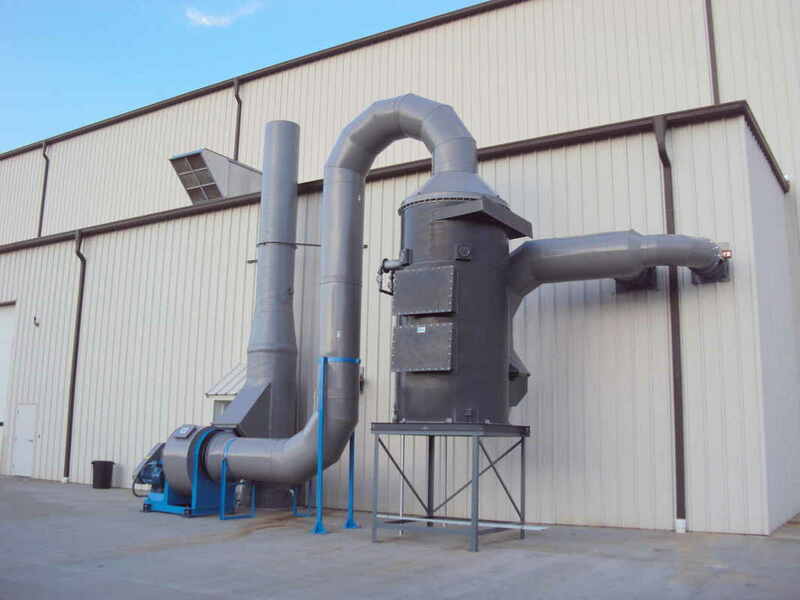 ​Venturi scrubbers are capable of handling airborne particulates in exhaust streams with high efficiency. 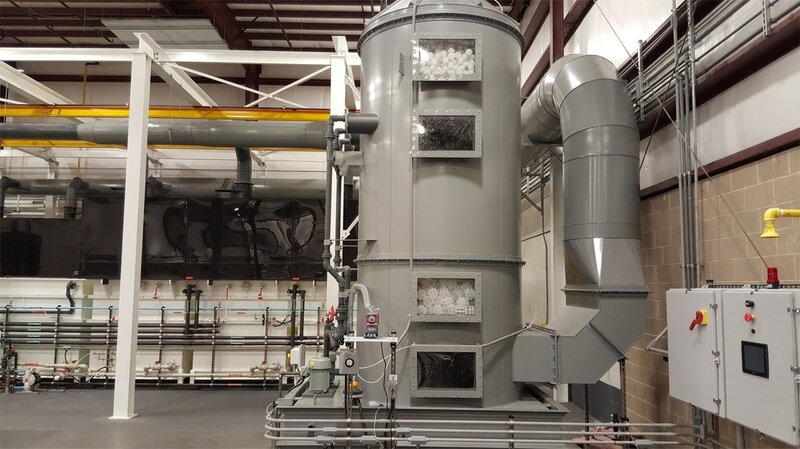 These scrubbers are designed to handle small micron to submicron sized particulates and capable of capturing high temperature moisture while simultaneously removing the coarse or fine solid materials & pollutants from exhaust streams. 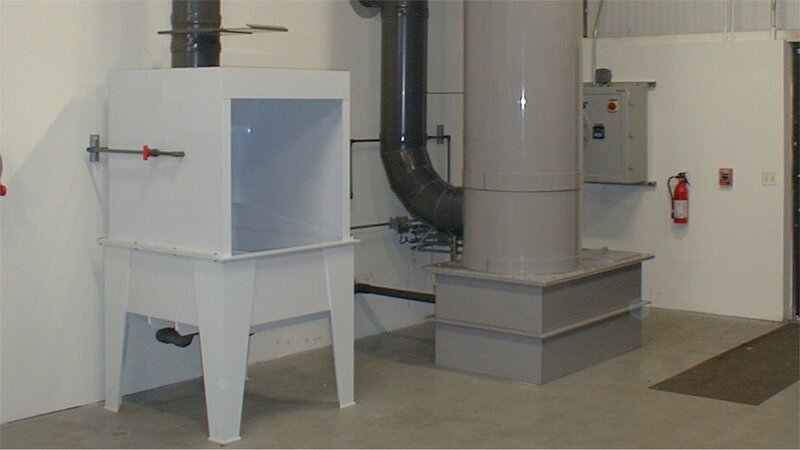 Custom fume hoods & manifold systems are designed to extract hazardous airflow fumes away from the working area, providing a safe & healthy environment. 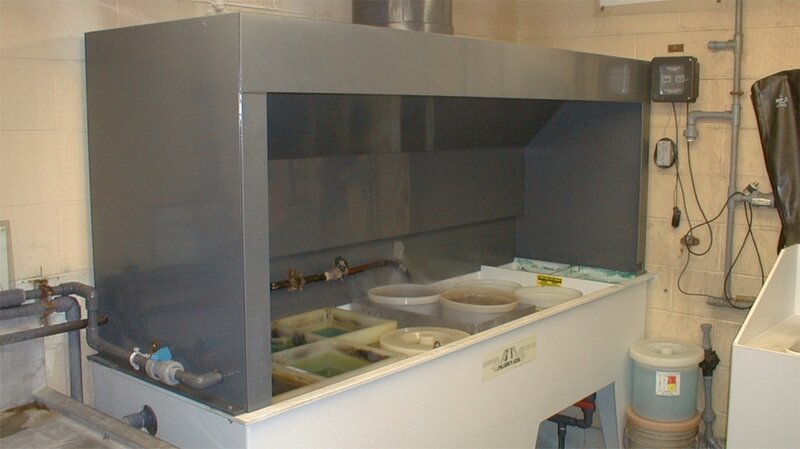 Fume hoods are designed with chemical resistant material and can be shaped to any size to fit any new or existing tank. Elimination of odors and chemical fumes protect the surrounding area, keeping parts and materials free of chemical residue that may effect the finish product. 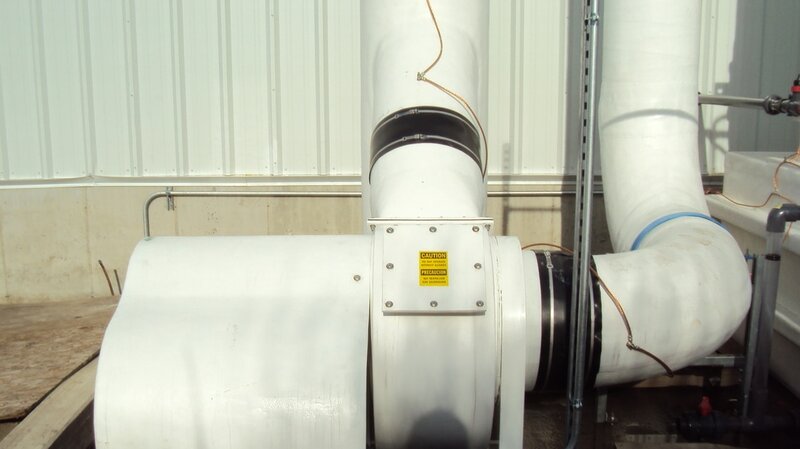 ​​Hoods, Ducts and Fittings are integral to a Ventilation System. Hood capture velocity, size and cfm of duct work, and static pressure required to pass through the Duct and Fittings are all key components to making sure tanks are ventilated properly and ensures the Scrubber is able to efficiently treat and removes all contaminates in the air stream. Mech-Chem offers a large variety of Hoods Duct and Fittings. They not only range in any size to meet ventilation systems needs but can also be constructed out of several types of plastic or metal. Hood designs are customized to meet the size and process performed in the tank. Base on the type of process, how the part is carried in and out of the tank and tank size Mech-Chem designs Fume Capture Hoods, Push Pull Hoods and even Pull- Pull Hoods. 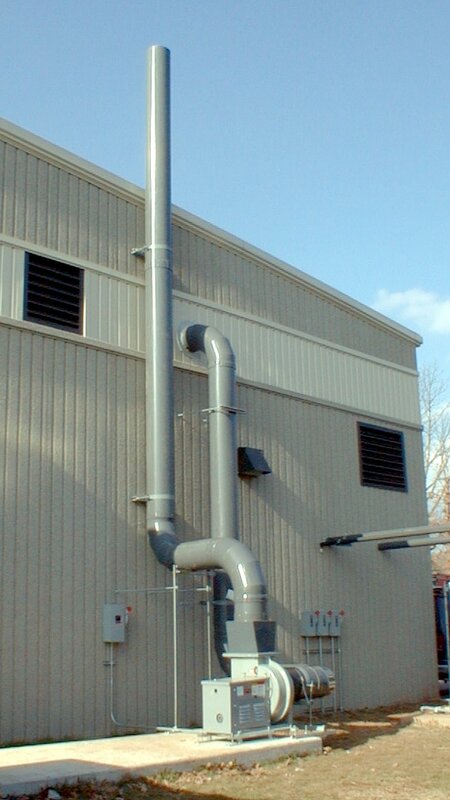 ​​Mech-Chem designs, builds and installs all types of Ventilation Stacks. Mech-Chem integrates the location and size of the Stack into the facility based on the layout of the system as well as the air permit requirements. Some buildings are designed to carry the weight of the Blower and Stack needed for the Ventilation System while other facilities cannot bear the extra load and need to mount the Stack at ground level. Mech-Chem factors in the building loads when designing mounts for roof units to disburse the load. And for ground mounted units Mech-Chem can design self-standing Stacks. Mech-Chem also has the capability to design these Stacks with wind and seismic loads based on their geological location. These PE (Professional Engineer) designed and stamped drawings are not only the basis for the fabrication of the stack but can be submitted to local building authorities and insurance companies to verify that all requirements for design and installation methods are met. ​​​Mech-Chem also has on staff Chemical Engineers which perform calculations based on the amount of chemistry that will be drawn into the Ventilation System. These calculation and knowledge of the fumes being emitted by the process allows Mech-Chem to assist in the permitting of the air discharge. These calculations and the air disbursement requirements laid out by the permit will dictate the height of the stack. 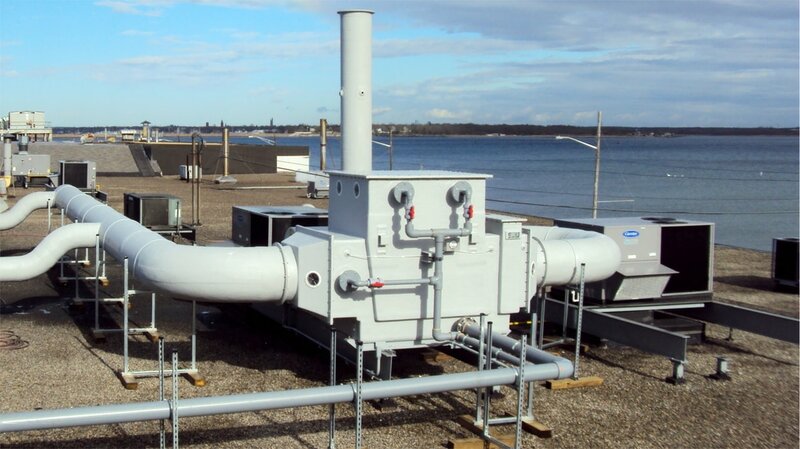 Our knowledge of processes, emission rates of chemical baths and efficiencies of scrubbers allows us to help facilities layout the best location and required design for their air emissions Stack. ​​Mech-Chem designs and builds Lab Hoods, Bench Top Ventilation and Enclosures to deal with any amount of space or access the facility may require. These Lab Enclosures are capable of drawing off any fumes generated by storage of bottles, chemistry, mixing of solutions or performing of bench top tests. 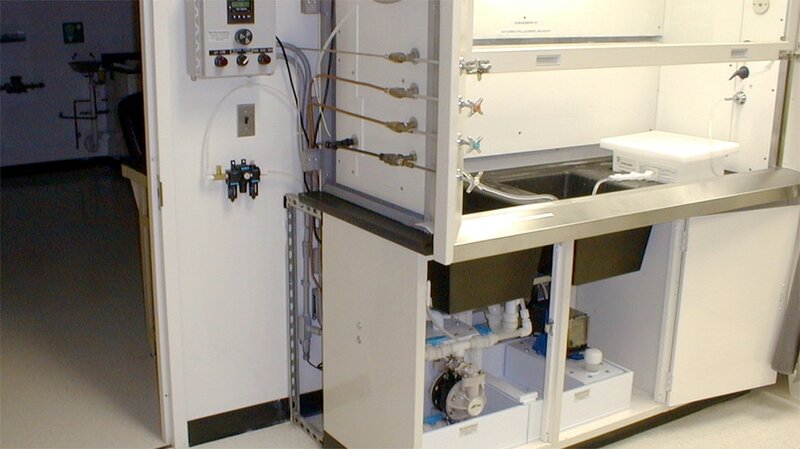 In addition to the Ventilation, other features such as sinks, sumps, shelves, sliding covers, and more can be incorporated into the Lab Enclosure. Depending on the facilities air permit as well as the amount of chemistry the new process will emit, the system may not require a Scrubber. A simple Exhaust Blower (Fan) may be adequate in order to draw the fumes generated into the Ventilation System and discharge them to atmosphere. Mech-Chem tries to design and build the most economical system for the facility. 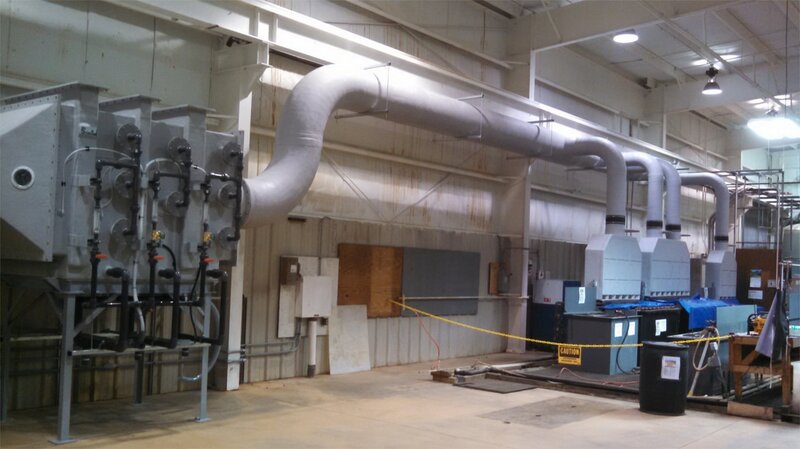 If no additional equipment is required to meet the Air Permit Specifications, an Exhaust Blower and Ventilation System is the most efficient way to meet OSHA and EPA regulations and keep cost in line. Air Make-Up is extremely important to a successful Ventilation System. If the room has an inadequate amount of Make-Up Air a slight vacuum will be created in the area. This vacuum will render the hoods and other fume capture systems inefficient as negative pressure in the process area will prevent the fumes from entering the hoods and allow them to linger in the process area. Increasing the static pressure in the Scrubber, or raising the flow rate of the Scrubber in a process area that has a lack of proper make-up air, will not rectify the situation and in fact will only increase the problem. Make-Up air systems need to be designed to meet the customer’s needs, requirements of the Ventilation System and outdoor climate conditions. Depending on your location requirements for the Make-Up air may vary from dealing with cooling, heating, dehumidification or all three. Mech-Chem specializes in understanding variations in climates and designs the system accordingly. The Air Make-Up to the room should be approximately 10% less than the rate of air removed from the room via the Ventilation System. This will prevent the room from being over pressurized and forcing any corrosive air out of the process area. Air Make-Up Systems, unlike HVAC Systems, are single pass units and cannot rely on circulating the air back through them in order to gain efficiency with heating and cooling. Make-Up Air has to be heated, or cooled, instantly as it passes through the respective chamber. In areas of high humidity, the air has to be heated in order to dry it out prior to the cooling phase. If moist (humid) air is simply cooled prior to removal of any moisture, the air stream will pass through to the dew point. At the dew point the moisture will drop out in the process area filling the distribution header with water and causing a film of moisture to form on all surfaces. It is also important to ensure size and location of the duct and registers don’t inhibit the Make-Up Air from entering the process area. If the air distribution is not even and laminar when exiting the registers, the air flow can cause air scourer or eddies to form in or around the process tanks which could cause the fumes to be pushed away from the hoods and into the work area. Mech-Chem takes all of these factors and more into consideration when designing and layout your Ventilation needs. Push Air Systems are designed to direct fumes and vapor towards the ventilation Hoods in order to maximize the capture of these gases. 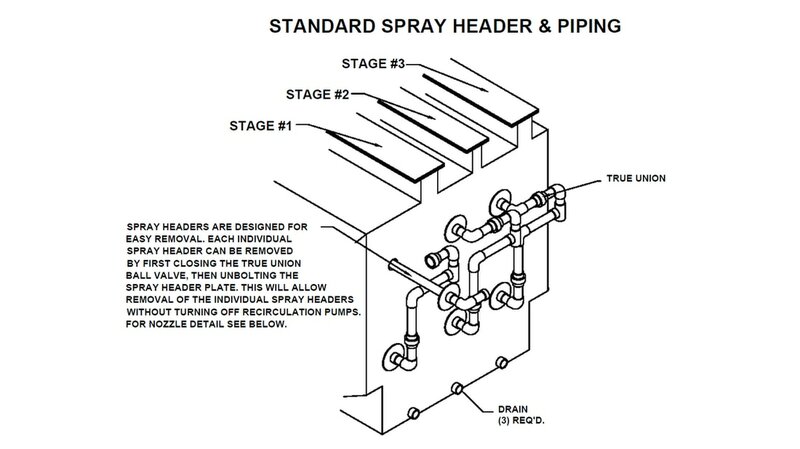 When Push Air is used in this fashion it is referred to as a Push / Pull System. This type of Ventilation setup is incorporated once the width of the tank exceeds Thirty-six inches (36”). The CFM of the Push Air is dependent on the width of the tank, chemistry in the tank, operating temperature of the tanks solution, size of the part, etc. The Push Air manifold is typically mounted on the front of the tank just a few inches above the surface of the tank. 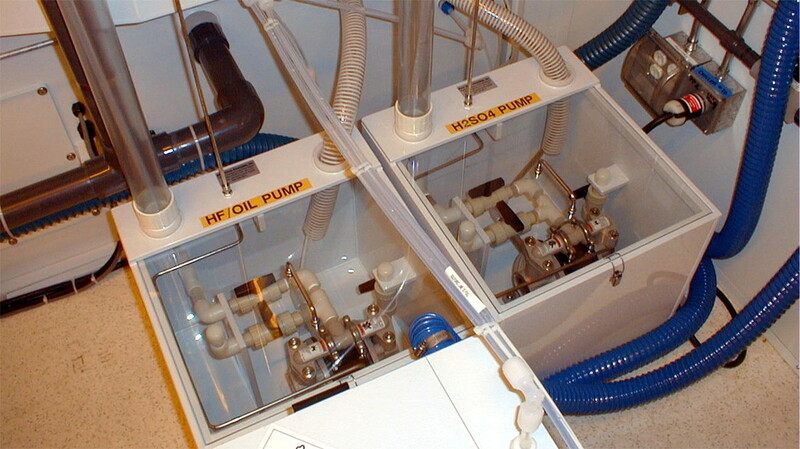 In some applications the Push-Air System can be set at multiple levels. This is usually used for large parts that have to rise well above the surface of the tank and are still producing vapor either due to the chemistry or the temperature of the process bath, or both. Mech-Chem designs and lays out the entire system in order to deliver the correct volume of Push Air to the process tank. Mech-Chem also installs the Blower, Piping System and Push Air Header in order to deliver a fully functional system designed to maximize the capture of exhaust fumes and have a clean and safe work environment. Mech-Chem is very well versed in the design and manufacturing of Explosion Proof (XP) systems. 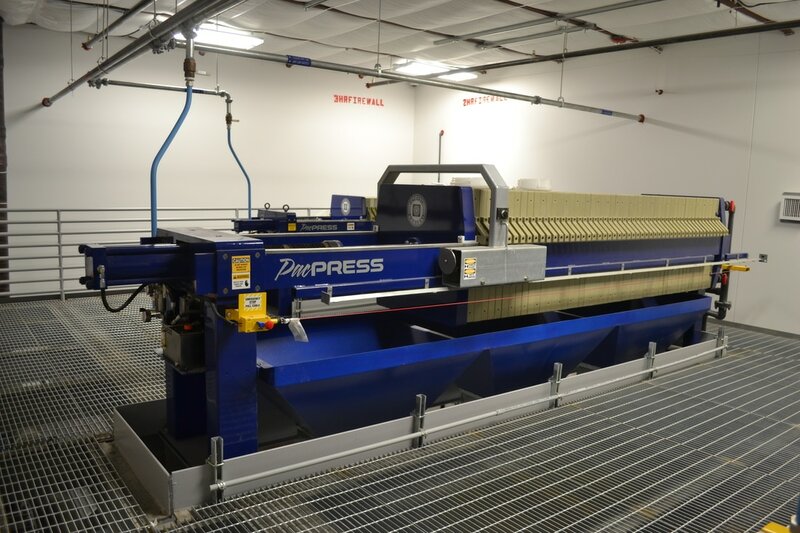 We are able to fabricate panels that meet the explosion proof rating. Mech-Chem also verifies that all equipment meets the explosion proof requirements established for the area. 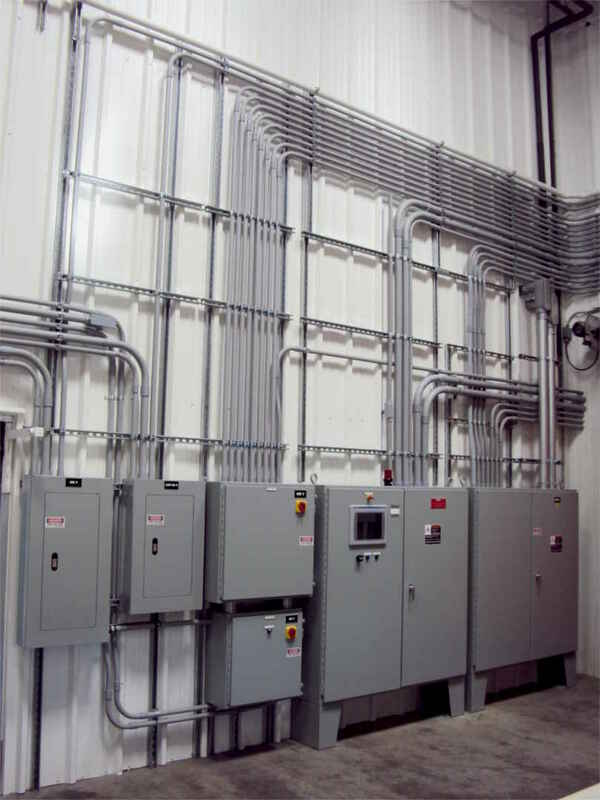 We design all the electrical equipment and wiring to be intrinsically safe. Mech-Chem maintains this level of protection throughout field installation in hazardous atmospheres by using Zener Barriers, Grounding and Potting (explosion proof sealers / Chico conduit sealer). 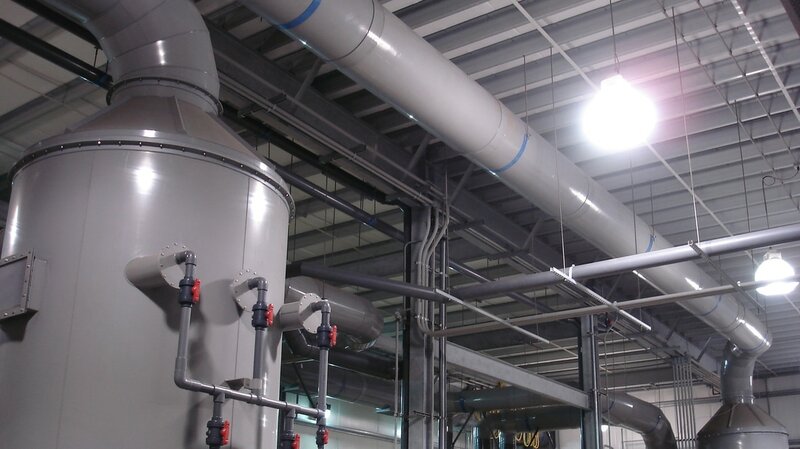 There are always State and Federal guidelines when it comes to Fire Rating and these guidelines need to be followed when designing and installing industrial Ventilation Systems. Mech-Chem not only engineers within these standards but also deals with local Fire Marshals and Building Inspectors, as well as the facilities Insurance Company, to implement the required Smoke and Fire Ratings. Mech-Chem has a Panel Fabrication Shop that Designs and Builds to UL Specifications and follows UL’s National Standards for Safety. ​UL representatives perform site inspections of the Shop as well as the Panels to verify that all UL standards and requirements are met. Mech-Chem applies the UL Listing Mark to its Panels and Back Panels indicating that the integrity of UL’s safety level, as well as its safety integrity, was adhered to. 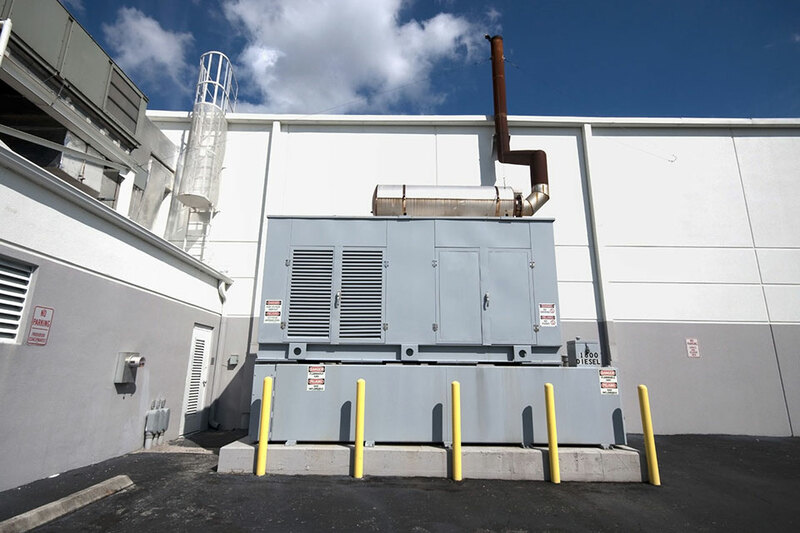 ​​In today’s Chemical Rooms a Generator is commonly used to keep the environment inside of the Facility safe for operators and personnel until the Line Power to the Plant is restored. Parts can also become trapped in the process tanks leading to vapors from the tank to continue to permeate the air inside of the room as well as potentially damaging the part. 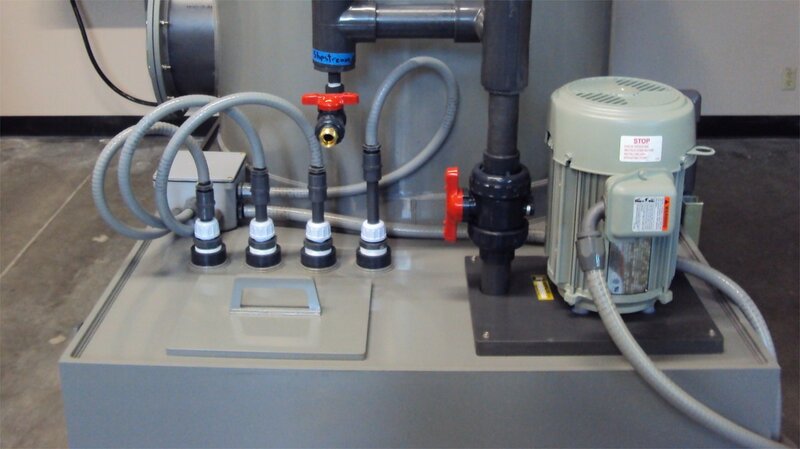 ​Mech-Chem has the ability to design, purchase and install a Back-Up Generator or interface with an existing unit. We provide all the electrical specifications the Scrubber will require to keep critical equipment operational during a Power Outage. Mech-Chem accomplishes this method of Emergency Operation in several ways depending on the style of Panel controlling the Scrubber (Relay Logic or PLC). It is very important to select the proper materials of construction for the Scrubber, Hoods, Duct Work, Blower and Stack in order to install a safe, highly efficient and low maintenance Air Pollution Control System. Certain variables have to be evaluated in order to make sure the materials of construction are chemically resistant to the vapors they are handling and treating. Out Door and In Door applications also have an impact on material selection, such as the need for items to be UV Resistant or hold up under intense heat or cold without deforming or becoming brittle. Materials of Construction also come into play when dealing with FM Approval and Smoke and Fire Rating. In addition the location of certain equipment, such as the blower and stack, can affect Materials of Construction as well. A self-standing stack located on the ground may require a more rigid material than a short stack mounted on a blower located on the roof of a Facility. Mech-Chem’s design team will select the correct Materials of Construction for your application. Mech-Chem has a highly skilled staff of Engineers educated in all fields of Engineering (Mechanical, Electrical, Structural, Chemical, Etc.). This diversity of expertise allows Mech-Chem’s staff to deal with any needs our customer may require. Their familiarity with Industrial Production techniques as well as all types of Chemical Processes allow them to come up a design to fit your needs. Mech-Chem is capable of producing Equipment Layouts, Process Flow Diagrams, Process and Instrumentation Drawings, Electrical Control Panel Schematics, Control Panel Door and Back Panel Layouts, Fabrication Drawings for shop assembly along with Equipment Specifications, Equipment Operator and Maintenance Manuals (O&M’s) and Operational Instructions as to the Operation of the Ventilation System. Mech-Chem is a full design build engineering firm capable of meeting all aspects of your air pollution needs. Our staff can provide assistance with Permitting, Wind and Seismic Calculations, Velocity and Air Flow calculations, FM (Factory Mutual) Specifications, Explosion Proof requirements and Fire Rating needs to name a few. Mech-Chem also offers services to deal with all phases of your ventilation systems from Hood Design, Push Air Systems, Air Make-Up, Push-Pull / Pull–Pull Systems, Duct Work and Fitting sizing and layout, Detailed Scrubber Design, Sizing of Blowers and Fans, Preventative Maintenance, Instrumentation and Controls, Installation as well as Start-Up and Training. Contact Mech-Chem to see how we can help you. 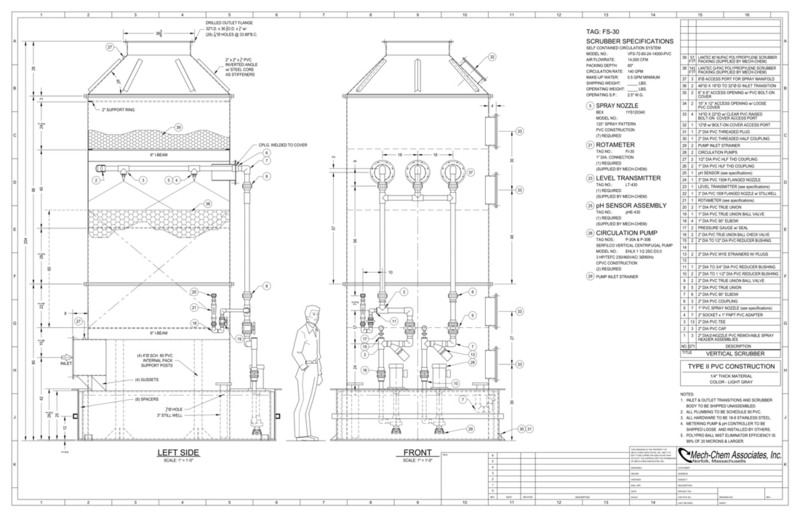 First, Mech-Chem produces a set of fabrication drawings that take into consideration the location of the Scrubber. We make sure the circulation pumps, instrumentation, access doors and other critical equipment or controls are laid out for easy access and maintenance. Access doors on the side of the Scrubber are oriented in such a way as to allow the packing to be easily inserted during installation while keeping in mind that the packing may have to be replaced in the future. Mech-Chem then produces Equipment Layouts, Process Flow Diagrams, Process and Instrumentation Drawings, Electrical Control Panel Schematics, Control Panel Door and Back Panel Layouts, Fabrication Drawings for shop assembly along with Equipment Specifications. When the project is complete, Mech-Chem sends to the customer a complete electronic set of As Built Drawings. Mech-Chem has on staff Chemical Engineers who perform calculations based on the amount of chemistry that will be drawn into the Ventilation System. These calculations, coupled with our knowledge of the fumes being emitted by the process, allow Mech-Chem to assist in the Permitting of the Air Discharge. These calculations and the air disbursement requirements laid out by the Permit will help dictate the height of the stack. ​The way Mech-Chem designs the hoods, ventilation duct work and fittings, as well as sizes the static pressure and CFM of the Blower, helps achieve the overall flow required through the Ventilation System. Calculating this overall flow starts with the Hoods. The size of the Hood slot openings combined with the size and style of fabrication determine the draw from the surface of the tank. Progressively stepping up the size of the duct work also helps maintain a steady, laminar air flow to the scrubber. ​If requested Mech-Chem can and will install dampeners on the hoods allowing the facility to reduce the flow to a particular process tank. Also, butterfly valves can be placed in the Ventilation Duct in order to restrict or shut off air flow if necessary. Usually this style of equipment is used on processes not required to run twenty-four (24) hours per day or seven (7) days per week. Automated Back Draft Dampeners can also be installed to prevent air from the outside atmosphere to be drawn back through the ventilation system. Additionally, Mech-Chem can test the performance of your existing system. Using a velometer Mech-Chem’s Technicians can verify and adjust the Velocity and Static Pressure throughout the entire Ventilation System. Another test, using smoke generating devices, allows Mech-Chem to evaluate the capture efficiency of your Hoods. The results of all of testing is compiled into a comprehensive report that is submitted to the customer, along with any field notes or general observations about the Ventilation System. ​Mech-Chem deals with chemical handling in a unique way. 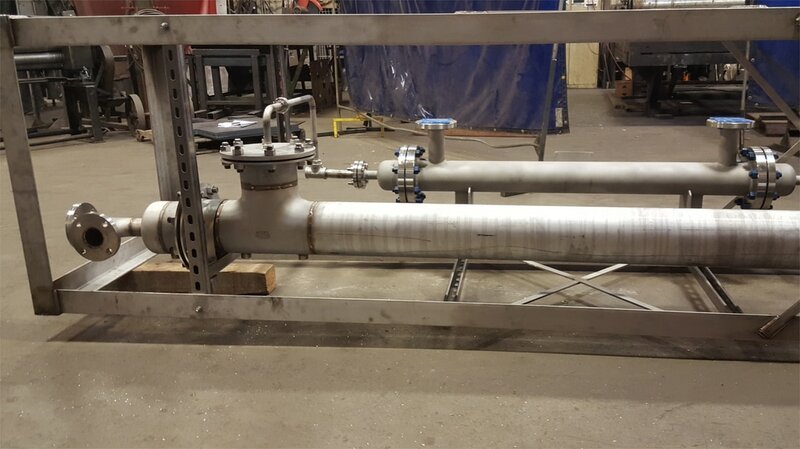 We design boxes or splash shields to set the chemical feed pumps in or behind to protect the operator from any splashing or chemical spray should the equipment fail. Tubing, depending on location and length of run, is double contained by running it through a clear PVC Pipe. 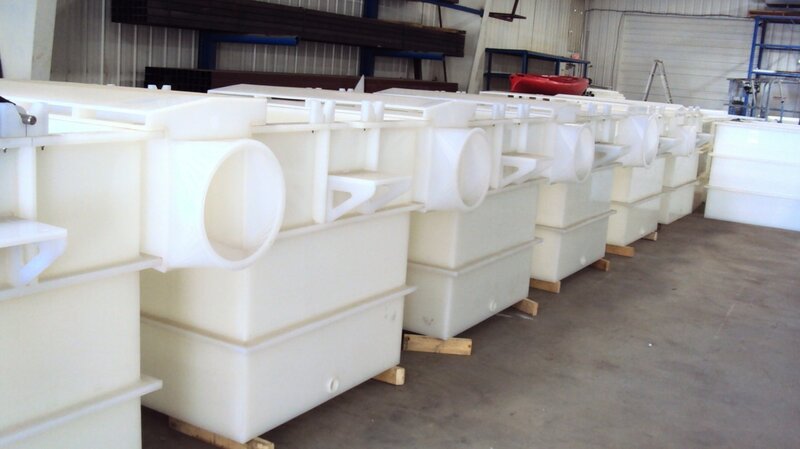 We also offer secondary containment for the Drums or totes to sit on in case of any leaks or failures. 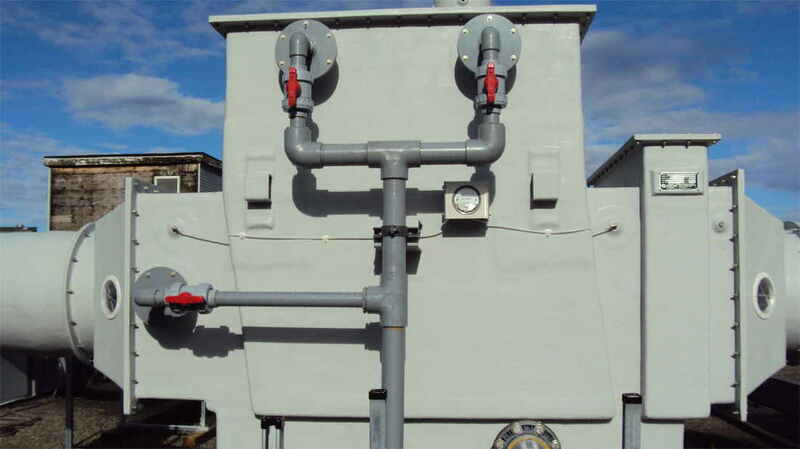 These vessels (Drums or Totes), as well as contaminants, can be monitored with level controls setup to detect and alarm if a vessel is empty or a containment is starting to fill with liquid. ​Automatic Chemical Feed is another feature of every Mech-Chem Scrubber. Using this automatic control function the Chemical Feed is controlled by the pH or ORP Controller via one of two ways. Mech-Chem also programs in alarm set points should the pH or ORP go too high or too low. This will let the operator know the pH or ORP in the Scrubber is not in its normal operating range and personnel intervention is required. Mech-Chem has a UL Certified Panel Fabrication Shop. 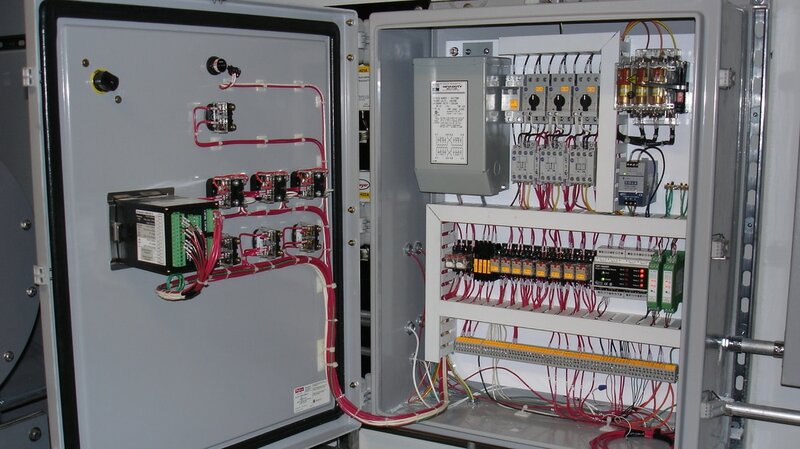 Our Engineers layout, design and fabricate control panels using NEMA Rated Enclosures. The Door and Back Panel Layout, as well as the Wiring Schematics, are designed to meet the requirements of the Facility. Panels can be built either using relay logic or PLC Controlled. 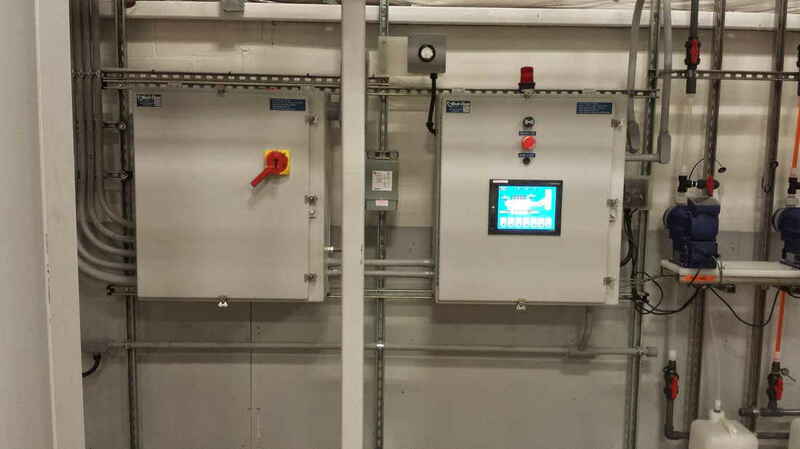 The panels can also come with Human Machine Interface (HMI) Touch Screen Panels which give the operator access to all instrumentation set points as well as displays all the functions of the Scrubber. The Screens will also display any alarms that occur. 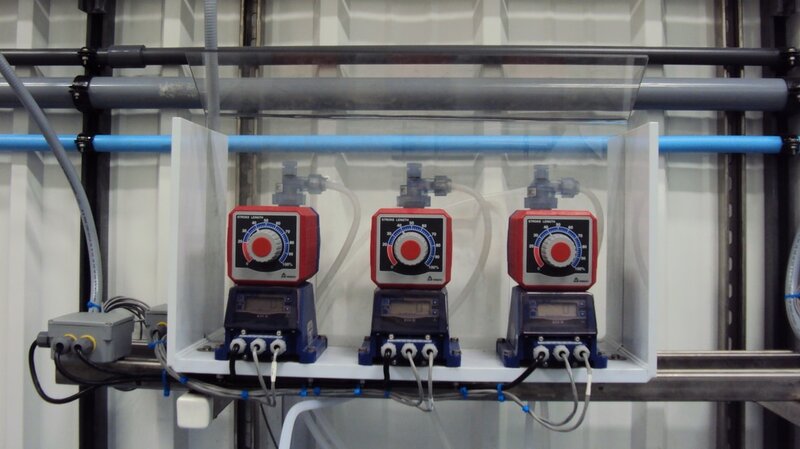 Metering Pumps (Chemical Addition) – This is setup using the input from the pH and ORP controllers. When the set point is reached the chemistry is automatically metered into the reservoir to ensure proper treatment of the gas stream. Mech-Chem has similar adaptability with regards to HMI (Human Machine Interface) Touch Screens. Mech-Chem’s engineers are very well rounded in HMI programming. Maple Systems, Allen Bradley Compact, Siemens Simatic and GE Cimplicity are just a few of the systems we have programmed and implemented over the years. ​Our programmers not only design and fabricate the panels but they even travel to site to ring out the wiring, verify the proper operation of the controls, and set-up and calibrate all the related instrumentation. 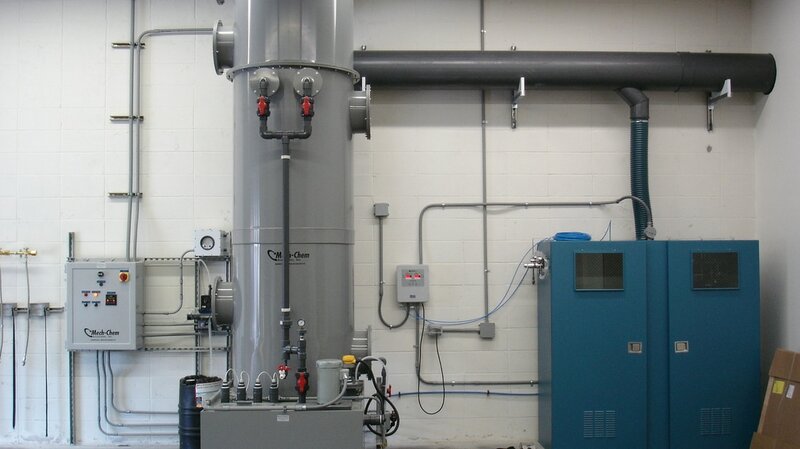 Mech-Chem also specializes in complete installation or disassembly of fume scrubber systems. Our field technicians are certified to provide full rigging services to ensure all scrubber parts and components are handled properly. Mech-Chem’s Installation Crew arrives on site with all the equipment required to set and install a Ventilation System. We travel throughout North America installing Scrubbing Systems and deal with local contractors for Crane and Lift services. Our Engineers, Programmers and Technicians are well versed in the installation of any type of material or system. Mech-Chem has an extensive knowledge of Ventilation System operation, from the Process Tanks to the discharge of the Stack. We take the time to review all aspects of the system so Management, Supervisors, Operators and Maintenance Personnel all have a strong understanding of how to operate, troubleshoot and maintain all aspects of the System. ​We review the drawings, HMI Screens, Set points, Functions and Calibration of all Instrumentation, and proper maintenance techniques with plant personnel. This review allows plant personnel to be confident they understand how to properly monitor the system, keep it running efficiently, and identify any instruments or components that may need to be calibrated, repaired or replaced. Want to keep your Scrubber working efficiently? Mech-Chem offers preventive maintenance programs for all types of fume scrubbers. Preventative maintenance programs help keep your equipment running at optimal performance while also extend the life of your operation. Although scrubbers are a low maintenance item, this services is also highly recommended to schedule in order to prevent any unscheduled down time and loss of production. General overview of the entire system to identify any areas that may need to be repaired or replaced. ​Mech-Chem’s Field Technicians are equipped to travel to any Facility and make repairs regardless of location. Our personnel carry all the required certifications in order to work on, in or around any equipment. The Technicians are certified in Confined Space Entry, Lock Out / Tag Out, OSHA 10, CPR, AED and First Aid, Fall Protection, PPE, and Hazard Communication. Our Field Personnel are also trained to work in any chemical environment and carry products to deal with chemical burns, even burns caused by Hydrofluoric Acid. Mech-Chem is capable of reviewing a facilities Ventilation System and recommending the appropriate changes required to deal with any desired modifications. We review the Velocity and Static Pressure of the Ventilation System in order to evaluate if it is currently running properly and what changes, in Duct and Fittings or possibly Blower modifications, may be required to meet the new demands on the system. ​Whether new requirements call for additional air flow, new process chemistry, additional vent lines or hoods for new equipment Mech-Chem can design and install the required modifications to meet your new or expanding production needs. 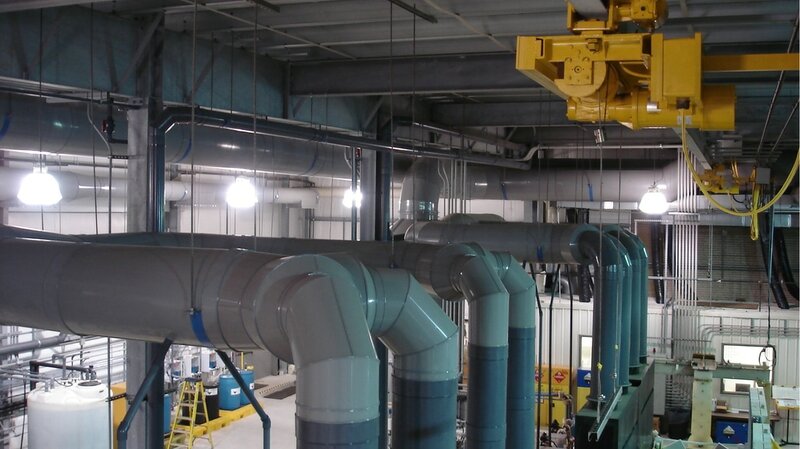 Mech-Chem Associates, Inc. offers over 30 years of chemical process design experience and expertise in the design, fabrication, and installation of fume scrubbers & ventilation systems. We provide technical solutions that can control, recover, and purify our client’s air streams. Mech-Chem's engineering professionals represent all the technical and engineering disciplines required for a complete process, system, or facility design including chemical, biochemical, geological, mechanical, architectural, structural, electrical, instrumentation, and environmental. These professionals can bring your air handling & fume treatment from conceptual design or development stage to a full scale operation. Contact Mech-Chem today and one of our Engineers will get back to you as soon as we can! "Send Us Your Inquiry Now!" 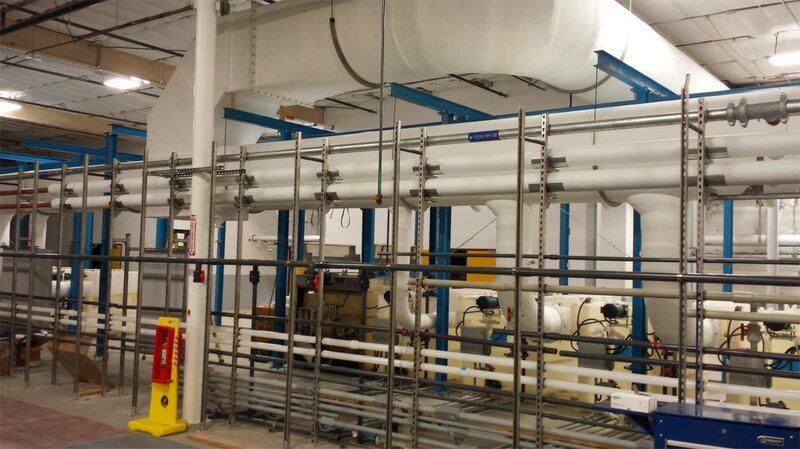 Mech-Chem Associates, Inc. is a full service engineering and design firm that specializes in the manufacturing and construction of chemical operations facilities, acid recovery systems, and fume scrubbing systems..
Visit Our Main Website Now!